Add some style and pizzazz to your Christmas decor. 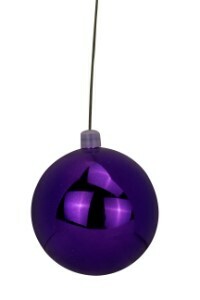 This purple, 70 MM, shiny ornaments come pre-wired with an 8" long, 26 gauge floral wire that can be trimmed for your needs. Each unit is UV Coated so it is able to be used on interior or exterior projects.